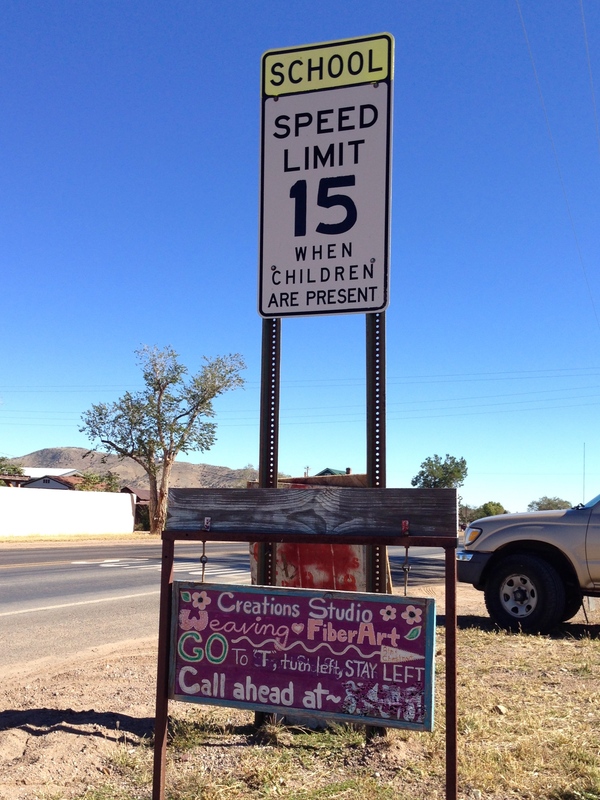 Do you know that New Mexico has a guide to rural fiber arts destinations across the state? 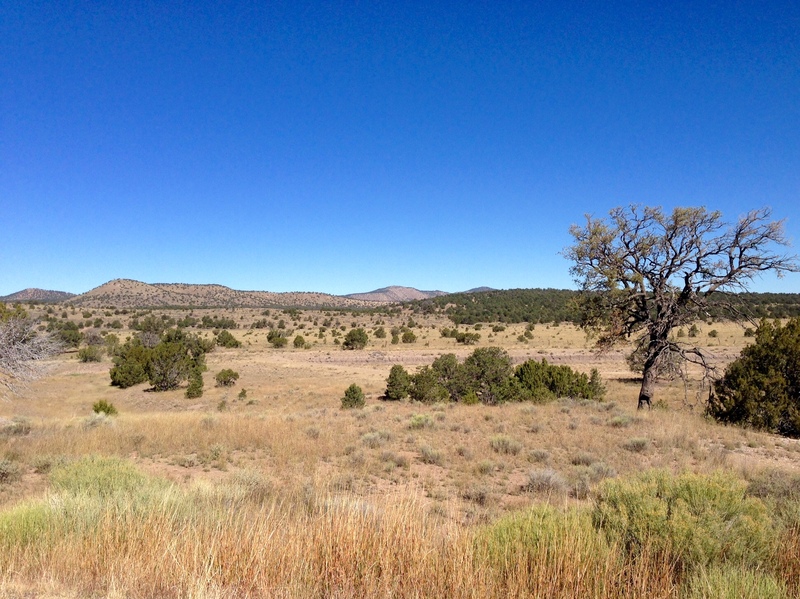 Last week, Steve and I dusted off the New Mexico Fiber Arts Trails, driving 1,100 miles through mountainous deserts and lush Rio Grande River valleys. We reveled in views of God’s creation, like cottonwood trees in brilliant yellow, and the Sandia mountains turning purple and watermelon pink in the setting sun. We visited interesting studios and shops all along the way, and encountered weavers who are true artisans. Cottonwood trees at their golden peak along the Rio Grande River. 1. Call ahead. Some of the stops are one-person studios, attached to a residence. Some places have changed their hours or days of the week that they are open. We drove two hours one day to visit a special shop, only to find a note on the door that said they were closed that day of the week. 2. Ask good questions. I like to ask a weaver a question that only another weaver would ask. Instead of introducing myself as a fellow handweaver, I like to let them figure it out by the questions I ask. 3. Wear something handwoven. My handwoven cap opened the door to conversation with other weavers. 4. Resist adding to your stash. 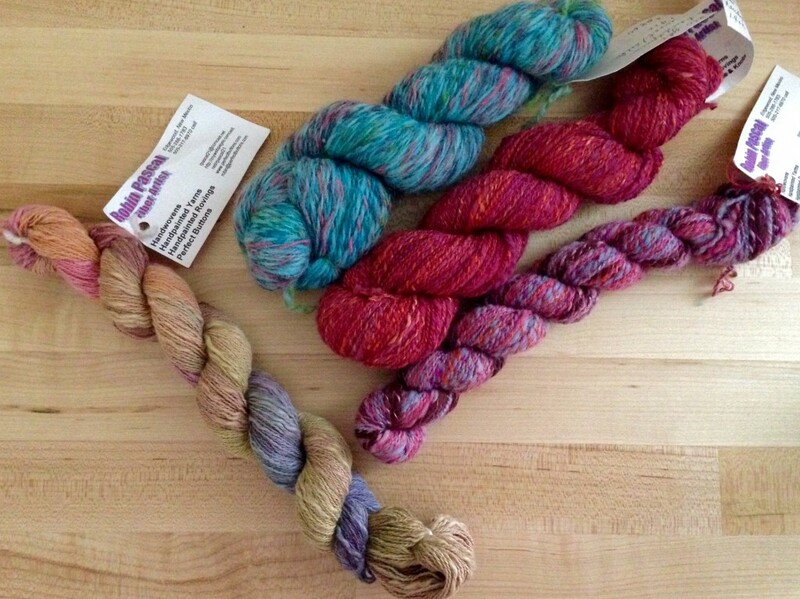 I knew that I would have the opportunity to purchase beautiful yarn, but I decided in advance not to add to my stash. I gathered information instead; and now I have more resources to choose from when it is time to order yarn. Located in historic Old Town, this shop has a Glimåkra Standard loom (like mine). Among other things, Kelly has woven rag rugs from strips of soft leather. 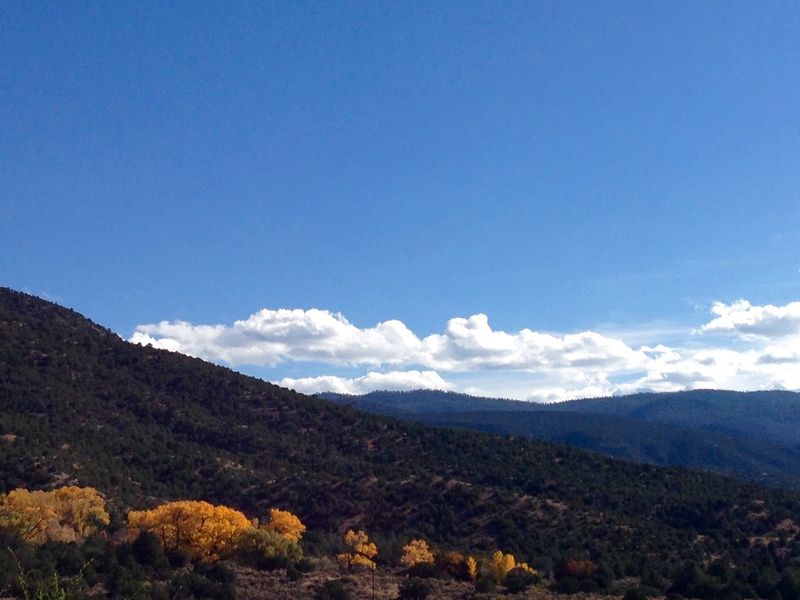 Majestic mountains and colorful cottonwood trees set the scene for exploration along the New Mexico Fiber Arts Trails. Robin’s studio is nestled in a scenic hillside covered with trees and wildlife. Her handspun yarn proved irresistible to me. This is where I broke my own rule of not adding to my stash. Too pretty to pass up, I came home with some of Robin Pascal’s beautiful handspun wool/silk, and a little skein of her hand painted cotton flake yarn. Amazing tapestry weavings on display! Teresa is the granddaughter of acclaimed tapestry weaver and author, Rachel Brown. Teresa carries her grandmother’s legacy by teaching tapestry techniques to interested students. There are Rio Grande walking looms in the teaching studio, where you do all the weaving standing up, not sitting. Who knows? You may see me taking a class from Teresa. Her passion for tapestry weaving is contagious. Enjoying the cool air in Arroyo Seco, Steve and I stand outside one of our favorite stops on this adventure. This outstanding tapestry exhibit is not to be missed if you are anywhere near the vicinity! Downstairs and upstairs, every room in this restored, old dance hall is adorned with exquisite pieces of traditional and contemporary woven tapestries by nineteen different artists. 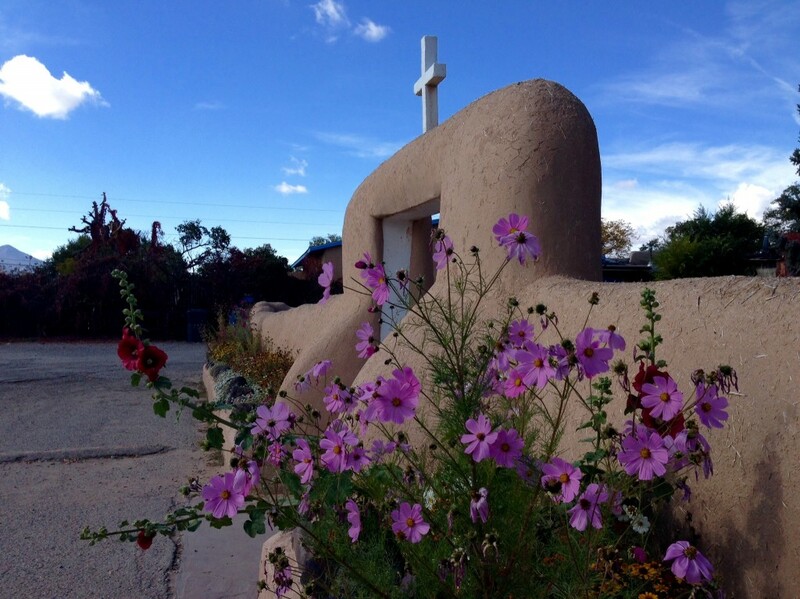 Serene historic chapel, San Francisco de Asis, is across the street from the renovated old dance hall, Old Martina’s Hall. We enjoyed an impressive tapestry exhibit at Old Martina’s Hall. 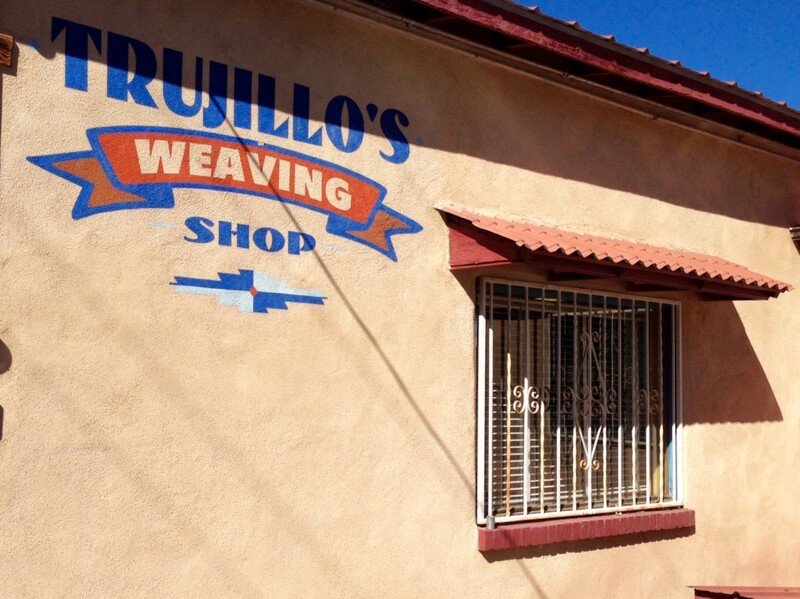 Chimayó weaving, a skilled craft, is passed on from one generation to the next. Irvin allowed me to watch and ask questions as he wove in the massive weaving room in the far end of the shop. It was inspiring to watch this master weaver at work. I found Irvin to be unpretentious, even though his expertise is astounding. You should see his intricate tapestries that hang in the showroom of the shop! Weaving is second nature to Irvin, who has been creating with wool on a loom since he was a young boy. 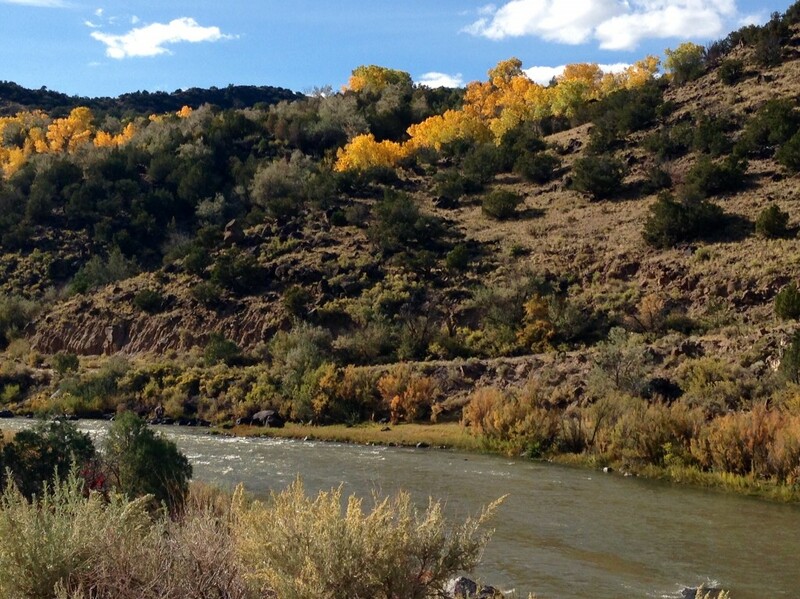 Rio Grande River in New Mexico is the subject of many woven tapestries. Artisans often find creative ways to interpret this beauty. Cat’s nine looms are clothed in colors that describe the terrain and sky of this beautiful mountainous desert. She took the time to explain each loom’s fabric to me, as I marveled at her skill of blending colors in the warp. Surrounded by mountains, the little sleepy town of Magdalena is home of an active weaving studio. The scenic views that Cat enjoys every day influence her selection of colors and textures in her weaving. 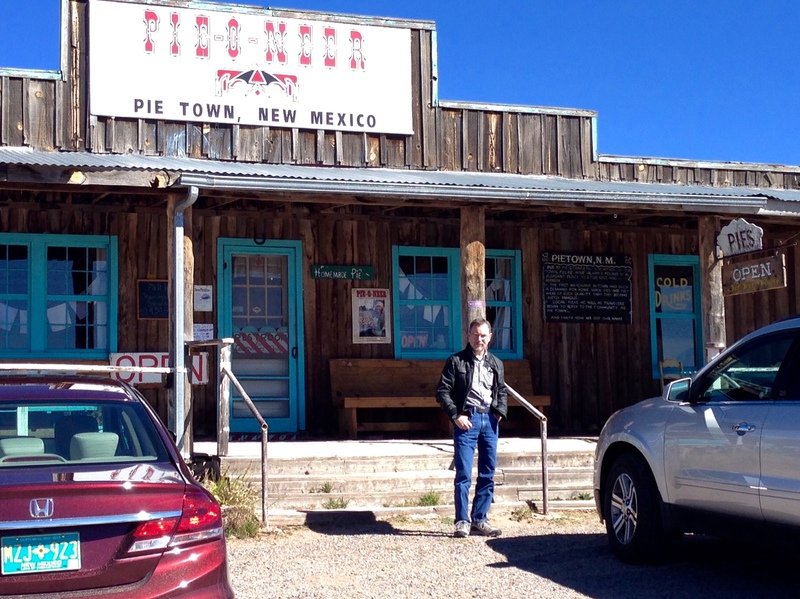 If you go as far as Magdalena, you might as well go another 56 miles to Pie-o-neer in Pie Town, New Mexico. The green chile stew is fantastic, but if I had known how good the hot-from-the-oven double cherry (tart and sweet) pie would be, I would have skipped the stew and ordered two slices of pie! Steve said the same about his slice of warmed peach pie. It was a great way to end our Fiber Arts Trails adventure. Nothing like a really good slice of homemade pie! May you go on explorations and adventures. 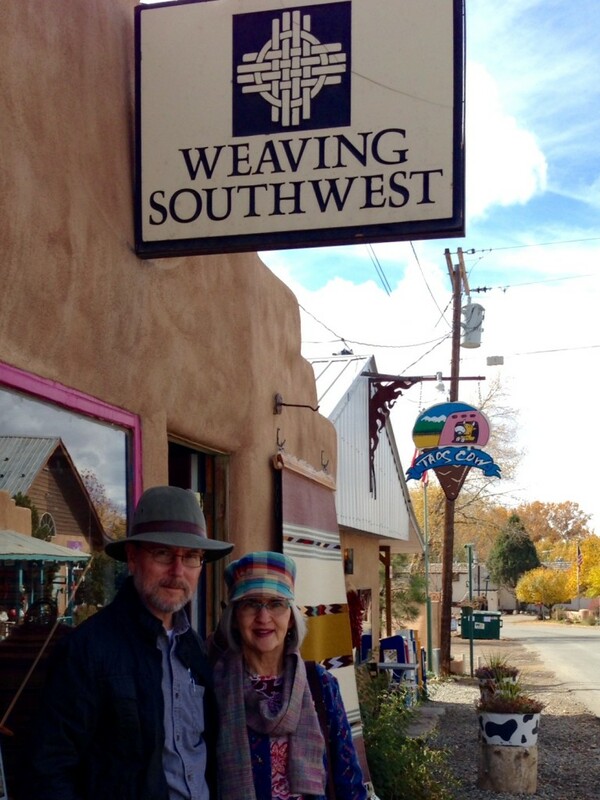 I love the picture of you and Steve in your hats outside the Weaving Southwest studio. You two seem to fit right in. 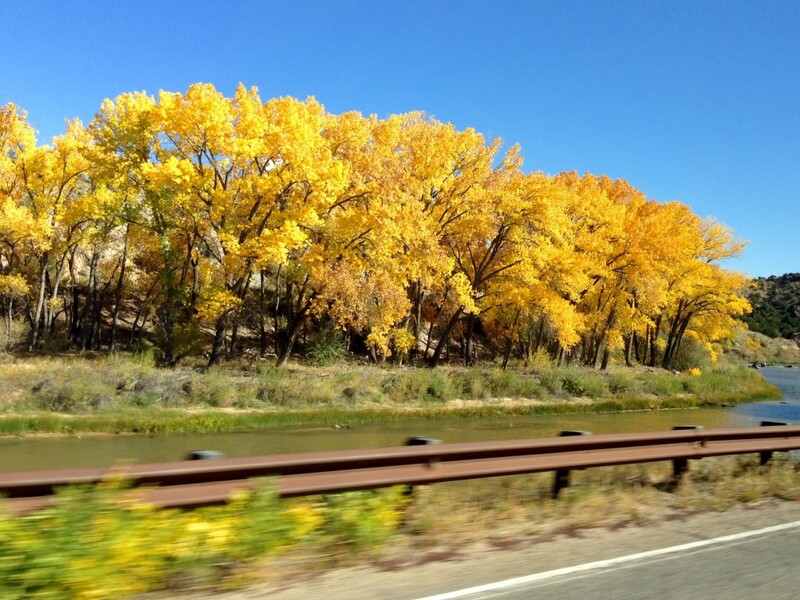 What beautiful fall photos you took along the way! Blessings to you, Karen! Steve and I loved the wild west scenery! Houston doesn’t have much of that. Helen, it’s always fun to see how other weavers do things, isn’t it? I think it’s fascinating to visit other studios, and see a wide variety of weaving styles. I always learn something! Thanks for posting this. I was just in Taos earlier this month for the Wool Festival, and of course, had to make it to Weaving Southwest in Arroyo Seco as well. Fun little town, isn’t it? I hope you got to have icecream at the Taos Cow next door to Weaving Southwest! As a matter of fact, Melanie, I did! I had delicious veggie pot pie at the Taos Cow for lunch, and caramel pinon ice cream for dessert. Very tasty!